I. After reached Lv 20, players can find a mentor from Mr. Derlyn. II. Players choose [Mentorship], answer 2 questions, system will recommend teachers according to the answers. III. Contact the mentor to team-up with him/her to meet Mr. Derlyn together. After chosen [Get an apprentice], if both sides are agree, the relationship is formed. I. When players reached Lv 50, can go to find Mr. Derlyn to get a mentor. II. 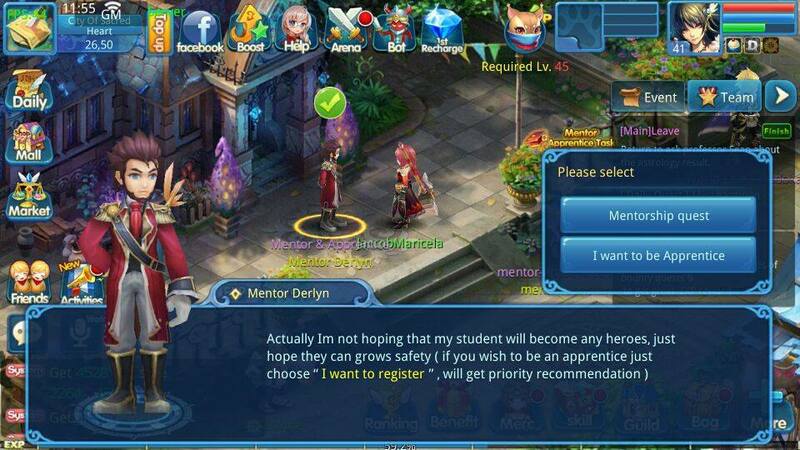 Players can choose [Be a Mentor], system will save players’ information, then recommend to those who seeking for a mentor. III. Team-up with the player, you have to be the leader and go find Mr. Derlyn. After chosen [Get an apprentice], and both sides have agreed the relationship is formed. I. Mentor can take a look of their apprentices from the lower left corner [Mentorship] button. It is including Tuition and Graduated apprentices. II. At the same time, apprentice will automatically get their daily task to do. Through guiding apprentice to finish the work and review the task, both sides will get rich rewards. III. Each apprentice have their own Growth Targets, they start doing it after get a teacher. When achieve the Growth Target, teacher and apprentice will get rewards. IV. One teacher can have 2 Tuition apprentices in the same time. When the apprentice has graduated, teacher can get new apprentices. There’s no limit for the total of apprentices. I. Apprentices tap [Mentorship] to open the page of teacher & apprentice. II. Apprentices will accept Daily Tasks voluntarily every day, apprentices can complete it individually or with the assistant of teacher. Then, ask teacher to review the tasks and both will get rich rewards. I. Teacher and apprentice team-up and go find Tutor Assist to accept 1 time per day Tutor Quest every day. II. Tutor Quest need teacher and tuition apprentice to accept, 1 round obtain 5 mini missions. III. Teacher can carry out mission with 2 different apprentices in 2 different teams every day. I. Apprentices can graduate from teacher when achieve Lv 65. II. Teacher brings the apprentices go find Mr. Derlyn, and tap [Graduate]. III. After graduated, apprentices will receive great rewards, whereas teacher will get different rewards depends on the Feats. IV. Apprentice will automatically graduate when Lv 70, if this situation happens, teacher will only get basic rewards. I. Teacher gets feats through Tutor Quest, Growth Target, Daily Tasks, and apprentices’ comments. II. If the feat of one apprentice to teacher is lower than 200, when graduate, teacher can only receive normal graduate reward. III. If the feat of one apprentice to teacher is higher than 200 or above, when graduate, teacher can get rich reward and chances to get Divine Pet! When apprentice Lv up, it will activate evaluation system to evaluate teacher. Teacher will get reward depends on the answer.